Jennifer Metcalfe has become one of Hollyoaks' most familiar faces over the years, and the actress hopes to stay on the soap for a whole lot longer. The star, who has played Mercedes McQueen since 2006, said that she feels "lucky" to have worked on the show for so long. "I just feel so privileged I've had that job all through my 20s," she told the Daily Star. "I feel I've learned so much and worked with some amazing people, so roll on the next 10. The producers do two or three quite big storylines with me a year and I'm lucky to have that." She added: "What else can you put her through? She died and then came back after all! It just works. She's a character who just carries on all guns blazing." It was previously announced that Hollyoaks will explore a stillbirth storyline next month as Mercedes McQueen's unborn baby dies. Speaking about the sensitive plot, Metcalfe said: "It was really hard to do and challenging as an actress. Filming it, I got that lump in my throat and that was it. By the end of it all, I was a mess. I was just sat there sobbing. "When it came to playing it on set I did minimal rehearsals because I didn't want to wear out the true meaning of the words. The scripts were written so brilliantly that didn't have to dig deep to find that level of emotion. The words were all there on the page. I broke down every time." The clash between Mercedes McQueen and Joanne Cardsley is about to heat up dramatically in Hollyoaks as the scheming solicitor takes drastic action to turn Joe Roscoe even further against his ex. As Mercedes makes a shock discovery about the drugs that were found in her handbag on her hen night, Joanne continues to pursue Joe and deliberately smashes her own tail light to get his attention. As she persuades Joe to go for a drink with her, Mercedes sees them together and angrily accuses her rival of sabotage. Mercedes makes it her mission to win Joe back but she hasn’t counted on just how scheming Joanne can be. After a series of actions leaves Mercedes fuming, she arranges to meet Joanne, who later shows Joe a cut to her face and accuses Mercedes of being responsible. Before Mercedes knows it, she has been served an injunction from Joe – how will she react as Joanne’s antics continue to pay off? Hollyoaks will explore "a really vulnerable" side of Mercedes McQueen in the aftermath of Joe Roscoe's tragic death. 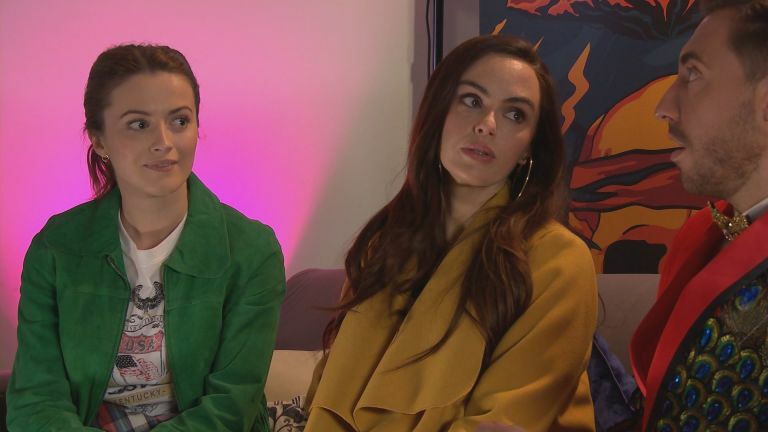 Jennifer Metcalfe has spoken out about her popular character's future after Mercedes - thankfully - managed to survive the chaos and carnage of Hollyoaks' latest autumn stunt week. Mercedes found herself in trouble when the fire started by Cameron Campbell spread to the mechanics of the ferris wheel, just when she and Joe were trapped at the top. Speaking about the death of another one of Mercy's husbands, Jennifer explained: "Every time she goes through grieving for one of her husbands, she reacts very differently. "What we've had with Joe is that we've seen a real maternal side to Mercedes. She was really ready for this. So now it's a completely different type of grieving from what we've seen before. "Mercedes has got the two little kiddies as well - Lexi and JJ, who she adopted with Joe after Lindsey died. So it's a question of what's going to happen to them as well. "Mercedes doesn't feel safe, she doesn't feel secure and her life's in ruins. We're going to see quite a vulnerable side of Mercedes that we haven't seen before." She added: "It feels like I've stepped away from the old character a bit, but I do want to go back to that! I don't want to be like this for too long, but to have that year off and be a little calmer, I liked as an actress to play with that." Hollyoaks boss Bryan Kirkwood has also been chatting about all things Mercedes, revealing that the change in her character this year stemmed from the tragic stillbirth storyline. Bryan said: "Mercedes is another character who seems to evolve brilliantly. We thought we'd seen every facet to her, but then when we told the stillbirth story 12 months ago, Jen absolutely stepped up a gear and became one of the best leading ladies we've ever had in terms of her performance. "She really moved people in a way that we weren't expecting. We had a responsibility to grow the character up in the aftermath of that. So we saw her want the thing that she didn't used to want. She wanted stability and she wanted kids." Mercedes McQueen finds herself at the centre of two huge Hollyoaks storylines next week as she desperately tries to console Scott Drinkwell – and sees a glimpse of Ryan Knight's dodgy side. As Mercedes and Scott's friendship grows by the day, she decides to accompany him when he heads off to meet the man he thinks is his biological father. Although it turns out that the mystery man isn't actually Scott's dad, he does still have some crucial information to share as he lets Scott know that the mysterious Greta is actually his mother Maggie. But with Maggie sadly not wanting anything to do with Scott, could this push him over the edge? In a separate development, Mercedes also makes a very intriguing discovery when she finds an envelope of money stashed away in Ryan's flat, but is this another clue to his darker side? Here, Jennifer Metcalfe reveals all the gossip you need to know on an eventful few days ahead for Mercy. Can you tell us what happens with Mercedes and Scott over the next few days? "Mercedes and Lily go with Scott to meet who he thinks is his real dad, which is funny in itself because they have to sneak into a press interview in a linen trolley! They can tell that Scott's really nervous, but they both want to be there for him. "They meet 'Ken', but he tells Scott that he's not his dad and reveals that Greta is actually Maggie – his real mum. Scott is shocked and wants to go straight over to see Maggie for more answers." "After being rejected by Maggie, Scott takes matters into his own hands and ends up trashing her house, which Mercedes walks in on. Mercedes drives the mischief in their friendship, which I really like because Scott's mischievous as it is, but she gives him an extra push. "Towards the end, Mercedes encourages Scott to pour whiskey over Maggie's record player – just to get her back for what she's done and not thinking about the consequences, dangers or health hazards of that. "They only realise that the record player has caught fire when DS Thorpe tells them and reveals that some of Scott's belongings were found at the house. Then they realise they're in deep, deep trouble." The next few episodes are also pretty big for Mercedes and Ryan. How are things going with them at the moment? "Mercedes knows there's something not quite right – one minute he's hot, and the next minute he's cold. She doesn't really know where she stands. She thought that Ryan was different, but he's just like all the other guys she's been with. "Mercedes and Ryan actually connect on quite a nice level, though. They have a good chemistry together and in this next week, they do form a genuine friendship. They comfort each other about Joe and Amy's deaths, which leads to them kissing and getting in bed together, which works for them in that moment and they just roll with it." "Everything's actually fine, until Mercedes finds a suspicious amount of cash hidden in Ryan's flat the next morning. At first she's like 'Oh, you can take me shopping…', but he bites and she knows there's something not quite right about this money. "She asks him outright and he's not giving her an inch, but she still knows there's something he's hiding." Does Mercedes see a future with Ryan? "At the minute, no. She didn't think he was like other guys, but he seems to be going that way, so I don't think she's even thinking about a future with Ryan yet. She's enjoying her time with him because he's the first person she's been with after Joe that she's connected with and I think she's living in the moment. "But I do think there's a vulnerable, desperate side to Mercedes where she does want that man to live happily ever after with her and that's never going to change." After these events, does Mercedes have any suspicions that Ryan might not be as clean-cut as he makes out? "She does, but I think she likes that – she's not worried that he's done anything too bad. Mercedes has always liked a bit of a bad boy and she hasn't had one for a while, so it wouldn't put her off if he was being a bit dodgy – as long as it wasn't anything too serious. She tries to pretend that she's all moral, but deep down we know she's not." As next week goes on, how does Mercedes help Scott get out of trouble? "Mercedes asks Ryan to help get the charges dropped against Scott for setting fire to Maggie's house, but Ryan says he can't and reminds her that he's helped her before so he's not doing it again. "Mercedes blackmails him and questions whether he'd want Uncle Geoff – DS Thorpe – to hear about the money that he's been hiding. Ryan doesn't even want to go there, so it's enough to persuade him to help Scott. I think the fact that Ryan fancies Mercedes also helps to sway him!" Once everything has settled down, what do Mercedes and Myra do to initiate Scott into the McQueen family? "Mercedes wants to lighten Scott up a bit because she's concerned about him. She's never seen him this down, he's really grey and non-responsive and doesn't have his own biological mother or family. "So Mercedes wants to offer him a piece of the McQueen culture and bring him into the family, which will hopefully help. They just do silly things and send him on errands around the village to pinch people's knickers and pants. "There's also a funny moment with Nana's mobility scooter. Scott is just causing general mischief and 'being a McQueen' and they bring him into the family." It's still not enough to cheer Scott up, though. Does Mercedes realise just how depressed he's feeling? "No, not at all. She thinks he's a bit down, but Scott's the sort of character who always puts on a happy front and is always going to be smiling and making jokes and putting on a façade. I don't think she knows at all how deep it runs for Scott. "There are moments in hindsight when Scott is actually crying out for attention, but Mercedes doesn't pick up on it. As far as she's concerned he's just her fun best mate, who can get over anything and doesn't let it affect him. "Mercedes would be gutted if she realised how down Scott really was, because she has built such a bond with him and part of why she loves him is that she doesn't have to think about what she says. She thinks he's as tough as steel and he can just cope with it." We know that you'll be going on maternity leave soon. What will you miss about Hollyoaks while you're away? "Obviously the people. Every day when you come into work, it's like working with your best mates, especially when you've worked here for 11 years. I'll just miss seeing the people every day and having a little chit-chat. I will not miss the 7am starts!" Have you and Chelsee Healey (Goldie) been swapping baby advice? "We have a little chat now and again. We're as bad as each other, though! She's got the same attitude as me, we're both going to take it in our stride and see how it goes each day. The odd time one of us will find something out that the other one doesn't know, we'll help each other out – we've had some emotional moments, it doesn't take much! "It's quite nice really because we're both going 'What the hell is going on?' I'm going to be in Newcastle for maternity leave and Chelsee will be in Manchester, but we're hoping to meet up when the babies are here for a play date." Jennifer Metcalfe has revealed plans to take 12 months off when her maternity leave begins later this year. mercedes returns for her wedding in magaluf is she marrying ex russ?